Millions of people in the United States south were affected by a massive storm this week inaptly named Pax. 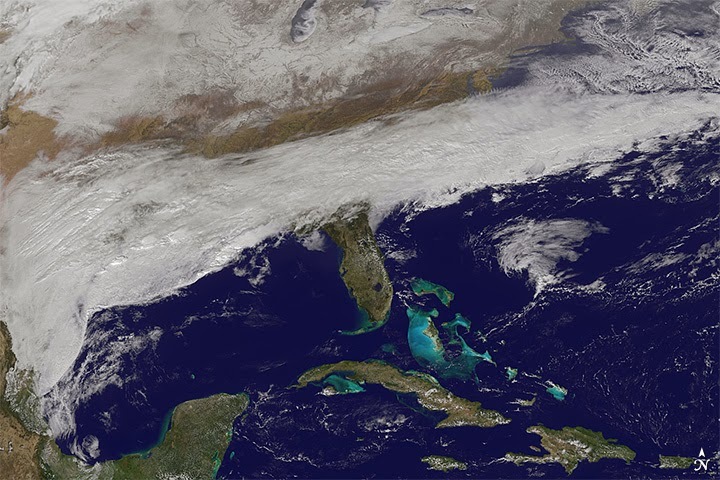 It stretched from Florida and Texas to North Carolina and brought ice, snow, sleet, freezing rain, wind, and tornadoes. Tens of thousands are without power and the cities of Augusta GA, Columbia SC and Raleigh NC were hit hard. Over 4000 flights were canceled. At the height of it, the Weather Service was so perplexed by this storm's behavior and what was to happen that they sent up the US Air Force planes to check it out, something they usually only do for hurricanes. Twitter: "USAF Hurricane Hunters flying winter storm recon mission over Gulf of Mexico 2nite obtaining vital atmospheric data"
Slate reported, "One measure of the storm’s severity, scaled to roughly correspond with similar indexes used to gauge tornadoes and hurricanes predicted today’s ice storm would reach Category 5, the highest level on the Sperry-Piltz Ice Accumulation index. 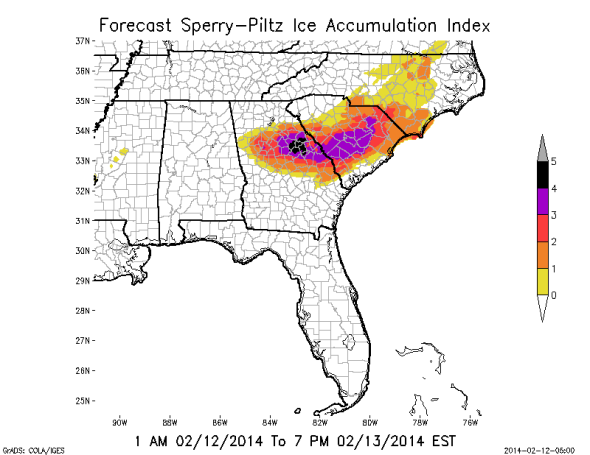 That’s an increase of one category since yesterday’s forecast from Atlanta eastward into South Carolina." Here we see the accompanying ice map, and the black blotch indicates that aforementioned category 5, very rare. The economic toll of a three-day shutdown in 7 states can't be calculated. And now Pax is barreling up the eastern seaboard and hammering Washington DC, the Mid Atlantic states and tomorrow, New England. One person on Twitter plaintively asked, "Are they naming winter storms now because they are as intense as hurricanes?" As the people in the south begin to climb, scrape and plow out of the massive winter storm Pax, and the people in the middle and northern parts of the nation begin to deal with it, did you know that there was another, massive and impressive storm battering millions of people in another location? "The Met Office has issued a rare RED WARNING for severe weather urging those living along the west coast of England to TAKE ACTION now. Hurricane-force gales of 110mph have ALREADY been recorded off the south coast of Ireland with onshore winds of more than 90mph rocking southern Britain. The storm has also triggered torrential downpours across the south and south-west with several inches likely over the next 24 hours. The Government has put out a raft of nation-wide alerts for brutal gales, rain and even snow in the north which is braced for blizzards. The public have been urged NOT to travel tonight unless it is absolutely necessary. Storm Darwin, currently battering the west coast of Ireland, will rip into Britain this afternoon before tearing though the country through today and into tomorrow." Communities across Britain were met with hurricane-force 100mph winds yesterday as stormy weather continued to batter parts of the UK, causing travel chaos and leaving tens of thousands of homes without power. 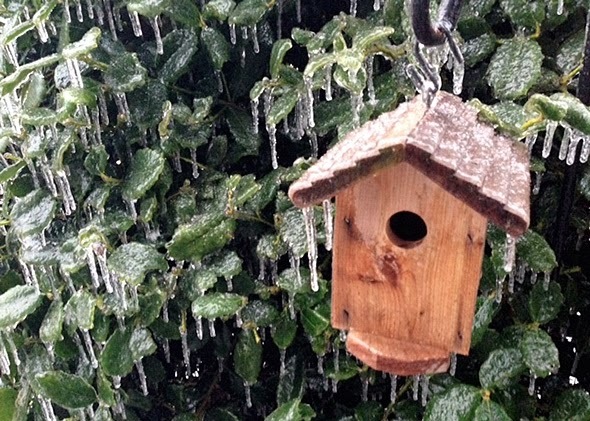 Today, 80,000 homes remain without power and further travel disruption is expected. 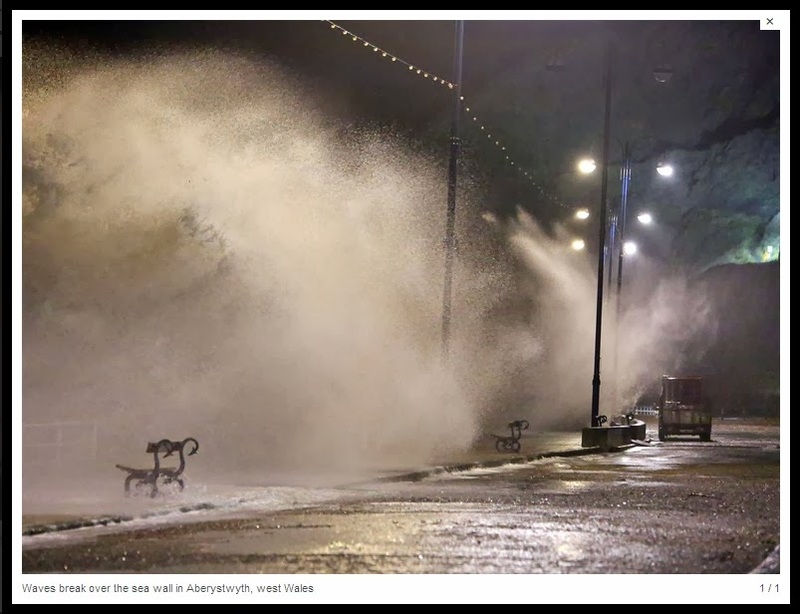 Gusts of 112mph were recorded in Aberdaron in North Wales, the strongest so far in the storm on the day dubbed "wild Wednesday". Britain remains on alert with the River Thames expected to rise to its highest level in more than 60 years and more than 400 flood warnings in place across England and Wales. As for that last headline, let's take a look at what "meteorological crises" are occurring. In Brazil, for instance, a historic drought is threatening the Sao Paulo’s water supply. The Cantareira water system, which serves over 10 million people, is usually flush at this time of year, as January is generally the height of the region’s rainy season. However, this year has seen so little rain that the city’s water could dry up in as little as six weeks; companies that depend on water for manufacturing have already had to close shop until rain comes. 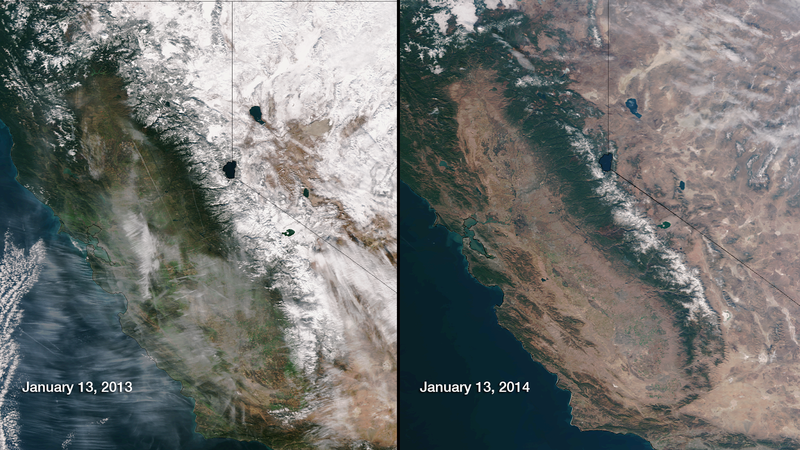 In California, the drought there is "the driest year in its history, leaving the snow pack in some of California’s Sierras is at as little as 4% of its normal levels. For the first time in half a century, areas that depend on the mountains for moisture will have to do without..."
In Australia, "record temperatures have caused large-scale conflagrations throughout the country, from Western Australia, to South Australia, to New South Wales. Meanwhile, a town of 3,000 is considering evacuating in Queensland after all but going without rainfall for two years." But this, this, is amazing to me. Slovenia as a nation is frozen over. Three days of blizzards and a freak ice storm have inflicted "the worst devastation in living memory" in the small Alpine country of Slovenia as life in half of the country is frozen in place. 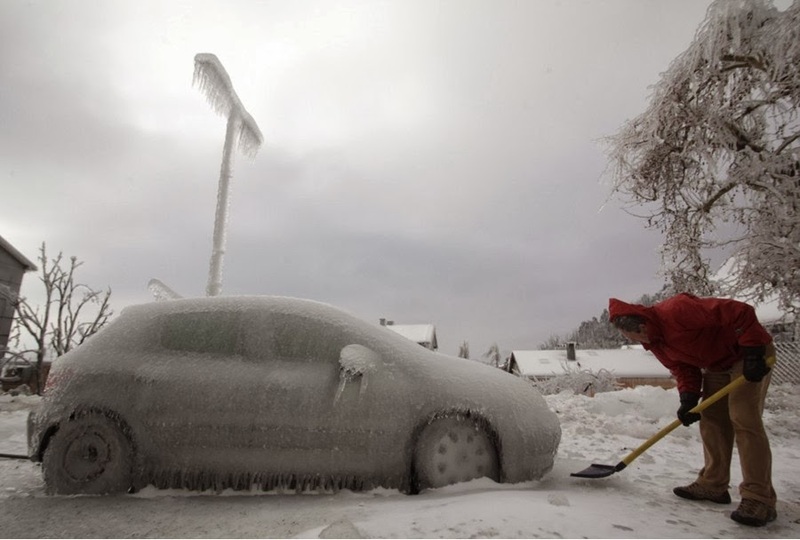 Unexpected rain in the west rapidly turned to ice, entombing cars, trains, ATMS, and power lines in addition to half of Slovenia's forests (roughly 1.2 million acres). "Slovenia has witnessed a major natural disaster," Prime Minister Alenka Bratusek said while visiting the badly-hit town of Ljubno ob Savinji. 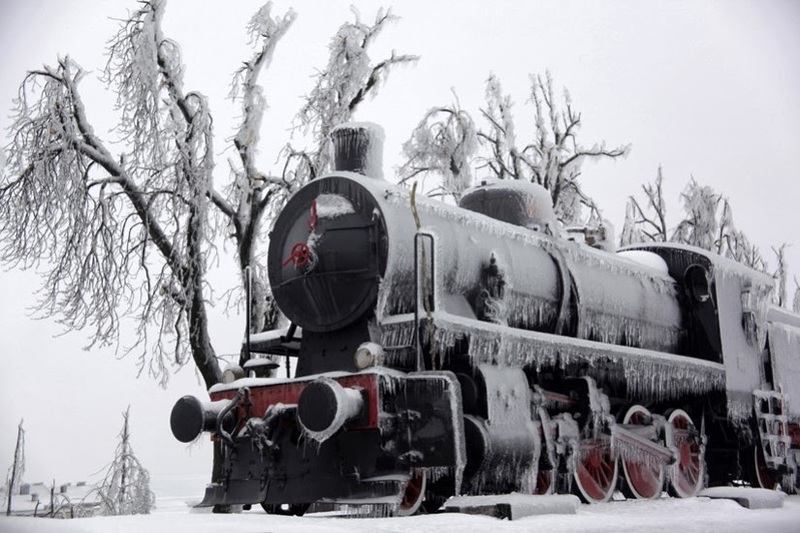 "In the 35 years I've worked here, I've never seen anything like this," A railway worker told Reuters. "It will take another two months before trains can run again." Life as they knew it has come to a halt in Slovenia and won't resume full force until the ice melts. That is simply amazing to me. In other earth news, if not climate news, did you know that there was an earthquake in Massachusetts this week? A small earthquake was felt in southeastern Massachusetts Tuesday, but no damage or injuries were reported. The US Geological Service confirmed that a 2.4-magnitude quake centered near Dartmouth occurred at 5:46 p.m. Within minutes of the jolt, WCVB's Facebook fans started commenting about what they felt. "Jumped off the couch it was so loud in Acushnet," Lori Souza commented on Facebook. "Heard a rumble then a boom in Fairhaven," wrote Nancy Vigeant. "Felt it in the far north end of New Bedford. I thought the dogs were running around but they were laying still on the floor," said Greg Cormier. Small quakes happen now and then in New England. There was one in Mexico, Maine last week, accompanied by a 2.8 in Canada/northern Vermont. There was a strong quake in China this week, a 6.9. Some damage in the sparsely populated area but no casualties, thank goodness. There was a 6.0 in the Scotia Sea and a 6.5 in Vanuatu, both areas of which are very seismic. Since January 1, 2014 there have been 12 strong quakes in the world. So people climbing out from winter storm Pax, if there is comfort to be had just know that there are many other places in the world experiencing the same if not worse weather. The headline above claims that climate change is causing all this havoc. News reports use words like crises, unusual, and rare. Most of the news stories I posted presented a statistic that stated the particular event hadn't happened in 30, or 40, or 50 years, if ever. The Slovenia situation has never happened before, despite being an Alpine nation sandwiched between Austria and Croatia. The Church of England has vowed to fight the 'great demon' of climate change. Okey dokey, good luck with that. "Climate change is a significant and lasting change in the statistical distribution of weather patterns over periods ranging from decades to millions of years. It may be a change in average weather conditions, or in the distribution of weather around the average conditions (i.e., more or fewer extreme weather events)." I'm not a scientist but as a lay person I'd agree with this. The climate is changing. However, the climate IS going to change, drastically, and it already has. There is a reason why the world is experiencing ever-heightening meteorological crises and natural disasters: the birth pangs. Jesus said that as His time of appearing came closer the world would experience birth pangs as it labored under the curse. The last two thousand years have plunged the world into 'the end of days' and as each day progresses we see leaps and bounds of prophetic indicators occurring. "Let’s begin by discussing what the Bible clearly states about the Curse. The Curse meant that humans and animals would now suffer pain, disease, and eventually death. Work would be difficult and sometimes painful as thorns and thistles now compete for the ground. Clearly, the earth, the plants, and all living creatures were changed as a result of the Curse. ... Although the second law [of thermodynamics, the law of decay] is not intrinsically bad, one difficulty remains. As a result of the second law of thermodynamics, the universe is “running down” as its usable energy decays to a useless form. Consequently, the universe cannot last forever. It must eventually run down completely. (Psalm 102:25–26)." If the second law of thermodynamics states that energy in a closed system will become less useful over time (decays) and the Lord said that the UNcreation of the universe will happen faster and faster as the time nears, then I wonder if there is a 'circle the drain' effect that impacts the 2nd law of thermodynamics. It might seem so. I don't think the rate of decay stays constant, but increases as The Day of the LORD nears. I personally believe that the extreme weather we are seeing, happening faster and faster, is an example of the nearness of the actual birth pangs, when the Lord will judge the world during the Tribulation. The church will be raptured to Jesus in heaven before that time, and we'll enjoy our rewards ceremony while that is all going on. You can be part of the blessed group, the church, AKA the Bride, if you appeal to Jesus for forgiveness of your sins and make Him the Lord of your life. Truth be told, are you really happy right now with satan as your lord and master? Because if you're not born again, that is who you serve. (Galatians 1:10, Matthew 6:24, Romans 6:16). Climate change, global warming, it is all in God's hands. He created it, He sustains it, and He will judge it. Earth and its perfect climate will be restored. Jesus is currently in heaven, He "whom heaven must receive until the time for restoring all the things about which God spoke by the mouth of his holy prophets long ago." (Acts 3:21). The time of restoring will happen, and I can't wait! Come soon, Lord Jesus! Answers In Genesis: Global Warming, Fact or Fiction? Wow, with the severe weather changes going on worldwide like this, sure seems it's TIME to hear that trumpet, huh? I can't wait either, Elizabeth! Praying it will be soon! Really interesting article, Elizabeth. I live in southeastern MI and I have heard a few people around here who have lived here forever say they have never seen such a cold winter. We've also had about 5 feet of snow, which is more than usual for this part of MI. Having grown up in WV, this is certainly an adjustment. Don't know if you caught the news story about the 8 vintage corvettes sinking into a massive sinkhole in NC, but this post made me think of it. Lots of sinkholes opening up around the world too. Praying Jesus returns soon too! Ok Elizabeth I have to chime in with this. PAX? Ok, it seems that there maybe much more to this than just a storm. Pax Romana? A link between ancient Rome and America? Really interesting post, Elizabeth. The Corvette sinkhole happened in Bowling Green, KY, near Mammoth Cave. Melissa S.
As I see all of this craziness with our weather, I cannot help but relate it to the treatment of Israel by our President and Secretary of State and the promise of Genesis 12:3. Melissa is correct. The Corvette sinkhole story happened in Kentucky. Sorry, I messed that up. Thanks for the correction. Brian, not too sure about that. Canada had a bad winter too, including ice storms. Their Prime Minister is a staunch supporter of Israel. Like Elizabeth said, I think the bad weather we're seeing is a sign the birth pangs are upon us.